Rangers Ballpark in Arlington, home to the Texas Rangers, was opened in April 1994 and is located between the cities of Dallas and Fort Worth. Over the course of its almost 20 years in existence, the venue has also hosted the MLB All Star Game in 1995, the first MLB ever interleague game between the Rangers and San Francisco Giants on June 12, 1997 and has also saw two World Series in 2010 and 2011. For tickets to games and other events at Rangers Ballpark in Arlington, you can find the best deals right here at SeatGeek. 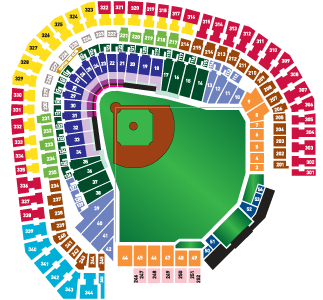 For a look at the seating chart for Rangers Ballpark in Arlington, check out the image below. The venue seats 48,114 as of the 2012 season.